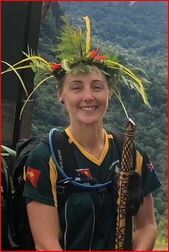 A personal highlight this year was the trip to PNG to walk the Kokoda Track with other members of the Clarence Valley Anglican School community. Although it was physically challenging, the history of the track, the wonderful people and the beauty of the country made it really worthwhile and I can recommend it to other students and staff. It is a great activity for members of your family to do together and you are certainly looked after by Kokoda Campaign Tours. Scott, Stuart and team ensured that it wasn’t just about getting from Kokoda to Ower’s Corner as quickly as possible but that each member was looked after and learned from the experience. I will certainly be encouraging students, staff and parents to participate in future tours. After searching the internet and contacting multiple companies it was clear from the start that we would be taken care of by Scott and Stuart from Kokoda Campaign Tours. From the beginning our emails and texts were answered immediately and by the time we actually met them it already felt like we were good mates. The entire trip was so carefree for us and If anything bothered them they certainly didn’t show it (like delayed planes!). Scott and Stuart are both very knowledgeable and were always able to answer my many questions about the local Papuan people, their culture, the track itself and its history or even random questions about the altitude (sorry for all that btw!). It is clear to see both Scott and Stuart absolutely adore PNG and her people by their actions and interactions with everyone along the track. Even their local guides and carriers (legends) were all amazing friendly and with a supportive helping hand for you without ever being asked. What was extra special was that we were a small intimate group which allowed for each person to walk their own pace fast or slow while still being supported by a guide and carriers so you always felt safe and fulfilled. I would travel with these guys again tomorrow. And I would recommend them to anyone who wants a real, memorable experience walking the Kokoda Track empathetic of its notorious history. A huge thank you to Kokoda Campaign Tours for an amazing experience. 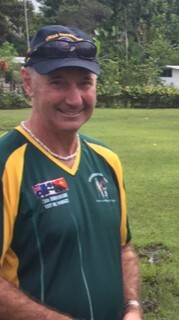 Rob was and excellent leader who ensured all trekkers received the maximum experience Kokoda offers. His knowledge of Kokoda is thorough and you will learn more from Rob that through books and journals. As a paramedic, we were in safe hands with Rob should any mishap occur. He took safety as his priority and at all times we were aware of any issues that may arise. The comradery around the campfire made the trip all the more memorable. I have no hesitation in recommending Kokoda Campaign Tours for the trip of a lifetime. Rob and his team of legends will not disappoint. And a huge thank you to Alicia for excellent assistance. I walked the Kokoda Track with Rob and Kokoda Campaign Tours from July 1st to July 10th 2014. I cannot speak highly enough about the trip and the experience I had. The 8 days we had walking the track exceeded all of my expectations. Rob was and excellent guide, extremely well versed in the history of the track and the events that led up to the campaign in 1942. His passion for not only the history of this significant event in Australia’s history, but also for the local people and environment was infections! All aspects of the trip were professionally organised. As a group we really never had to worry about anything except ourselves. The local porters or “Legends” were wonderful – always trying to make our experience a good one. The food was fantastic. Alicia put together the most sensational daily “ration packs”, with each day bringing new surprises. Simply put, they were hardly “rations”. We were spoilt for choice! As a group of 11, including Rob and his trusty assistant Dino, it couldn’t have been better. As paramedics, Rob and Dino were well equipped to deal with any emergency. Personally, with a cut to my hand, I was extremely grateful and relieved that my tour was led by two professional who were able to deal with my situation expediently and efficiently. I truly thank you both as it enabled me to complete the trek without further incident. Would I recommend Rob and Kokoda Campaign Tours? Absolutely, without doubt! Until the next tour, thank you for giving me one of the best experiences of my life! Second time across the Kokoda Track with Rob Brown and all the boys from Kokoda Village and it was just as good as the first time, possibly better with a great schedule and a great group of people. A very, very competent and caring group of carriers (Legends) and spoilt with two paramedics on board – and didn’t we need their help with fatigue and gastro hitting two of the group. Amongst it all there was great comradery. Fabulous history reports from Rob, professionally delivered and fabulous food thanks to the awesome Alicia. I can’t think of anyone I would rather walk the Kokoda Track with than this company and this great team. Thank you Rob, Robert and the boys! Walking the track surpassed all of my expectations of what it would be like. I originally thought it would be tough, boring and uneventful. How wrong I was. Walking with Rob provided and amazing experience culturally and historically. The passion with which Rob told the history of the track was amazing and made the track a very special place in my mind. At no point on the track did I feel unimportant as Rob connected with everyone and kept a watchful eye on everyone’s health. Passing other groups along the track bought to light how competent Rob was. There aren’t many tour guides with paramedic qualifications. Two of our group fell ill and without Rob they would have been helicoptered out. As well as Rob a special thanks must go to all the local boys who helped out with everything. I formed a special bond with many of the boys including Jerry and Tom. Having this connection made the cultural experience much more special. Kokoda Campaign Tours led us on a fantastic and unforgettable experience which will remain with me forever. Thank you. From the first meeting with Rob I felt totally at ease, with an understanding of how hard the track is, to put my trust in him to take myself as well as my two daughters aged 13 and 15 on this adventure of a lifetime was an easy decision. Rob is a very competent, knowledgeable and friendly person. His company which includes his New Guinea contingent put the trekkers first every time. As a trekker you are looked after better than any other. Importantly the food supplied is both plentiful, nutritious, actually the food is bloody great! Robs historical knowledge of the track, the villages and the battles that took place is incredible and really adds to the whole experience. Rob also has a knack of getting the best out of all his clients, especially when you look at the next mountain and doubt your ability. Rob is also excellent when dealing with teenagers. Being part of a school trek this is what really impressed and what I would say is second to none. Rob is also a qualified paramedic and will go out of his way to treat trekkers and local village people. This man is a genuine, well respected and a fantastic guide. I have no hesitation in recommending Kokoda Campaign Tours from the time you leave till you return home you’re his main and only focus. The trek by students from the Clarence Valley Anglican School (Grafton NSW) was an experience that surpassed all expectations. This was real education; a mix of history, cultural understanding, and of learning about themselves. To take a group of young adults into a foreign country to walk a track renowned for its challenges is to also ask parents to have faith that their welfare be held paramount. The pre-trek information and preparation provided by Rob was accurate and comprehensive and he addressed all questions in a responsible and timely manner. On the track, Rob, Ben and the trusted local legends were at all times competent and thorough in their planning, and considerate of the personal requirements of each of the trekkers. Our blisters were treated , our bellies well fed and there was always a helping hand or words of encouragement when needed. Rob’s knowledge and ability to passionately describe the war history complemented an already unique experience, and by the time we passed through the arches at Owers Corner, we had come to realise how fortunate we were to have walked in a special place. The memories will be lasting. From the outset, the professionalism, depth of knowledge, passion for the history and understanding of our group needs, were what truly impressed me about the team at Kokoda Campaign Tours. During the development phase, the assistance was always timely, never delayed and proved to be invaluable in our preparations. Rob’s forthright manner and obvious sense of humour was pleasing and he adjusts well to the mood of the group. Always encouraging and empathetic whilst also ensuring that the group stayed on schedule, stayed hydrated, remembered the real reason we were out there (Lest We Forget) and had more than enough to eat. The deliberate process of maintaining a small group also proved invaluable as we were all able to spend time getting to know Rob, ‘The Legends’ and the remainder of our group. This process was very effective in us forming a working team and everyone finishing within the Extreme Trek timeframe. I have never done ‘The Track’ before, however I have done more than my fair share of walking with a heavy pack through treacherous and unforgiving terrain. I also work in the Emergency, Safety and Risk management environment and found that Rob’s careful consideration of the risks weighed up against the possible impact on each days objective, was always favourable and he took great care in ensuring the wellbeing of the group. In short, would I trek with Rob again? Damn right I would. I don’t think you could do better in the selection of your Trek guide. Feel free to contact me if you want to talk about the possibility of utilising Rob for your Trek. Completing the Kokoda Track was one of the most rewarding accomplishments of my life. It is challenging on a number of levels but rewarding on so many more. I would strongly recommend it to anyone. I would also strongly recommend they do it with Kokoda Campaign Tours. The reason I would do it again with Rob and urge others to do the same is not because his phenomenal knowledge of the history, not because he is an extremely knowledgeable and experienced paramedic, not because of his wealth of experience crossing the Track. The reason I would go with Rob again and no one else is because he is a good guy who does the treks for the right reasons. He supports a lot of local people in a number of ways, he treats his legends (porters) with nothing but respect and he believes in the ANZAC spirit. It was a life changing experience. A very touching, life changing experience, was incredibly hard but very rewarding. I could not say one bad thing about the whole entire trip, perfect experience. Would come back and do it again. A++++++++. Rob’s passion for the Kokoda Track got me interested and soon after my training was underway. From the moment we landed in Popondetta and Rob was greeted like a long lost brother I knew I was in good hands. In between providing words of encouragement, expert medical care and light hearted jokes along the most difficult parts of the Track, Rob will provide a descriptive and accurate account of the battle that unfolded. His enthusiasm and passion for the Kokoda Track is outstanding and unrelentless. Expect an emotional journey from the moment you set out until long after you arrive back in Port Moresby. Rob is a leader who will lead from the front yet drop his pack and go back to assist those doing it a little tough. I have crossed the Kokoda Track twice with Rob and both times have had the experience of a lifetime. I am not a super fit person, although I keep myself very busy. I am a 56 yr. old retired teacher, married and a mother of 4 big boys. I hadn’t planned on doing the Kokoda Track until a friend mentioned it one day at the gym. I said “yes I’d love to do that!” Then I read heaps of information articles/books and thought what had I let myself in for. The walking, trekking and training stepped up, but I don’t think my fitness improved a great deal. I followed some of the ideas Rob emailed me. The overall medical safety of the trek was reassured as Rob had another Paramedic Emma on the trek as well so all medical dramas would be taken care of. Our legends were just fabulous. I hadn’t realised they would be so attentive to every need from making our dinners, pitching/striking the tents, digging drainage trenches around our tents in the pouring rain, holding torches for you when you needed a midnight wee, filling water bottles, drying washing and the list goes on and on, BUT most importantly helping me up and down the mountain sides. A hand to hold was just what I needed to get UP another mountain, or DOWN a really slippery part or AROUND a huge obstacle. He seemed to sense when I needed a hand and offered it freely. It was his mission to get me safely to the end of the Kokoda Track. A very successful job indeed!! Food- I had not expected so much, so much variety and it to be so good!! A pretty big feat considering where we were!! Itinerary-We camped at some beautiful villages and had picnic lunches by some pristine streams. Where in the world would you get that!!! Some trekking days were awesome, some were brutal-but you get that, it’s the nature of the terrain. Our fearless leader Rob- you were awesome!! Your passion for your job and your ability to share that passion with your trekkers is something I will treasure forever. Your love for the people made it really easy for us to relate to them plus allowed us also to fall in love with the beauty and ruggedness of this country. Your knowledge of the history of the Kokoda Campaign is phenomenal, but your passion for it brings it to life for a humble trekker like me! Your encouragement (along with my legends help) allowed me to accomplish a physical feat I am extremely proud to have accomplished! I have had the privilege of being shown a beautiful, fierce terrain by someone who is sharing his love of this country and its Kokoda Campaign history with his small band of trekkers. What an amazing trip! It was by no means easy, and on day 2 I got very sick, lucky that Rob and Emma were there to give me an injection! We were also able to go at our own pace stopping along the way for either a break or a history briefing on the significants of the area that we were standing in and walking through. The food was sensational, we were given a day pack that had lots of goodies in it and lunch was always something to look forward to. Overall I can’t tell you how much I enjoyed trekking with Rob, and how well we were looked after. I will be going again with Kokoda Campaign Tours! Kokoda Campaign Tours offer a very professional, historical and supportive trekking experience. Rob is very passionate about the country, the Track and its history and this is evident the whole way along the Track. It was also fulfilling that the company put’s back into the communities of the Track, in particular supporting the village of Kokoda and an orphanage in Efogi. The Legends(porters) were also drawn from these communities and formed a strong, loyal team who offered beyond a portal service to ensure our comfort and safety were priorities on the Track. Rob also ensures safety is a high priority with paramedic support on the trek. As a trekker who fell ill on day 2 with gastro and consequently suffered severe dehydration, I was privy to receive supportive IV fluids on track so I could recover and finish. Without such a high standard of medical support I am unsure if I could have recovered to finish. Rob was also very flexible with the itinerary to ensure all trekkers could reach their goals. It was a great feeling to cross the finish line and such an accomplishment that was achieved with the support of the whole team and a great experience I will never forget. Well what can I say – you’ve just gotta do it, an unparalleled Aussie experience. 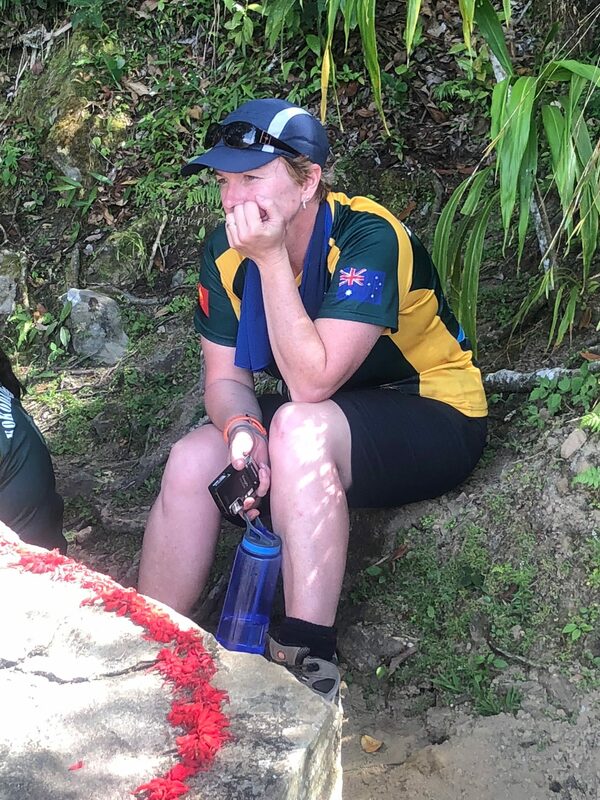 My wife and I decided to walk the Kokoda track for a few different reasons; as a personal challenge, to gain a deeper understanding of the tracks history and what it means to today’s Australia and to experience a new culture whilst walking through some breathtaking terrain. Although the walk was a mentally and physically demanding 7 day’s the historical aspects, scenery and cultural experiences are second to none and in saying that we have both travelled the world extensively and experienced many different cultures and environments. We were fortunate to go on the track with Kokoda Campaign Tours and I must say our guide Robert knew every inch of the track and its full history like the back of his hand – this guy was so passionate about the track and it values, you just can’t help getting drawn in by the spirit of Kokoda as you proceed along the track. Our porters, more appropriately termed legends, were great they assisted us uphill, downhill, across the many logs bridges and of an evening they would dry our gear and cook up an awesome feed. I would thoroughly recommend Kokoda Campaign Tours as they are very professional and had planned for all contingencies. The trip has made us even prouder to be Australians and the words, Sacrifice, Mateship, Endurance and Courage are held in much higher regard after walking in the foot steps of our heroes. Don’t be put off by the physical demands of the track and think it’s far too hard to complete because the feelings of respect, elation and accomplishment will far outweigh any discomfort you experience. If you are reasonably fit and WANT to complete the Kokoda track then you can do it.